When a Hellcat dies, I don’t think it goes to heaven. But if it gets lucky, its 707-horsepower engine will live again in another machine. Like this old Jeep Grand Cherokee, which, I think, is one of the first of its kind to make a quarter-mile pass with Hellcat power and all-wheel drive. And sweet merciful eight-pound six-ounce baby Jesus, the thing sounds like a fighter jet trapped in the Lincoln Tunnel. The engineers at Fiat Chrysler Automobiles, of which Jeep and Dodge are subsidiaries, are already running themselves ragged cramming enormous engines into every car its companies offer (Oh! Oh! Do the 124 Spider next!) but the official Hellcat-powered Jeep Grand Cherokee Trackhawk won’t come out until next year. That leaves some room for enterprising independent outfits like True Street Performance in New York to come up with their own high-horsepower luxury Mopar mall crawlers. I dropped the shop a note to ask about details on the build, and its owner Jim got back to me to break it down a little bit. Basically, the story started like so many others. “We had an extra motor and a donor body we were trying to decide what to do with... and came up with putting them together,” he said. The truck’s owned by the shop as something of a development mule. 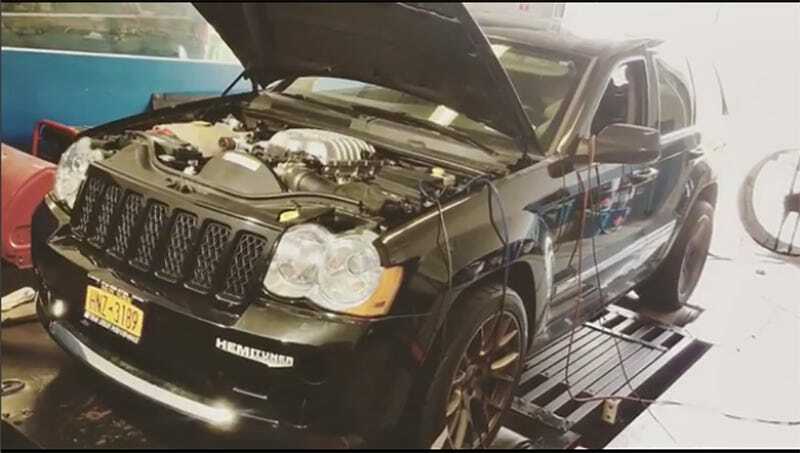 Jim told me a customer had called him asking about getting his own Hellcat Jeep custom made by True Performance a few weeks ago, but since it wasn’t something the shop had ever undertaken, Jim and his team wanted to experiment on their own time before selling the service. The engine apparently went in fairly easily. The challenges, Jim explained, were “lots of little things” like relocating the battery, power steering pump, and other engine bay-mounted accessories. The final product took about three weeks to finish, and runs a Paramount Performance version of the Jeep’s NAG1 transmission which Jim said is rated to survive 1,000 horsepower. High-strength axles and a new differential were added to the build, but power goes through a stock transfer case which is apparently tough enough for the task. Here’s a casual clip of the swapped Grand Cherokee making a sub-11 second quarter mile pass with all four wheels being powered at Maple Grove Raceway in Pennsylvania. Unfortunately, the audio gets a little screwed up by another competitor enthusiastically revving their engine. But man. That. Thing. Looks. Fast. I’m sure Hellcat swaps will get even more creative as more of these engines hit the market. And we’re all excited to see what people and small shops cook up. Let’s just hope that the builders behind this “Hellhawk” Grand Cherokee and future similar projects take the time to upgrade their brakes, too. This one’s only been finished for a couple days, but it’s already breaking necks. Every build will of course be a little different, but he indicated that somebody wanting their own Hellcat-swapped Jeep would probably be looking at about $40,000 to $50,000 to have the job done right.